As a graphic design student at Rowan University, in 2001, I created a strategy game for my senior project. The game was based on an ancient symbol I had learned about, called "The Flower of Life". This pattern of interlocking circles has been used in art & architecture all over the world. It has been found on the walls of the Temple of Osiris in Egypt and was studied in depth by Leonardo da Vinci. The classic game I designed came to be known as "Da Vinci's Challenge" and has won some of the top awards in the toy industry. I am now looking for a new publisher, and also for a way to get an electronic version of the game developed. I created the animation below to demonstrate the way I envision an app or video game to look & play. I know that experienced game developers would have many ways to make it look even better. For more info, ideas, or licensing opportunities, please email 3amoebas_@_comcast.net (delete the spaces) or visit the official Facebook page. Thank you. This animation shows concept art for a "Da Vinci's Challenge" app or video game. 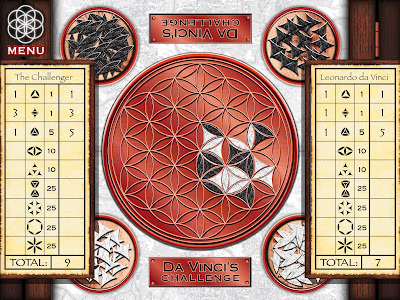 "Da Vinci's Challenge" is an award-winning, classic strategy game, based on the ancient wisdom of sacred geometry. The game board is 'The Flower of Life' symbol, used in the art and architecture of many cultures around the world for thousands of years. • Use the triangle & oval pieces of your color to form the 'Secret Symbols' on the score sheet. • You can block a Symbol being made by your opponent to play defensively & prevent them from forming a pattern in their color. • A player can strategically place a piece to form a 'combo pattern'- where two or more Secret Symbols are formed in a single move. • The player who scores the most points by the end of the game- WINS! All material © 3 Amoebas, Inc.